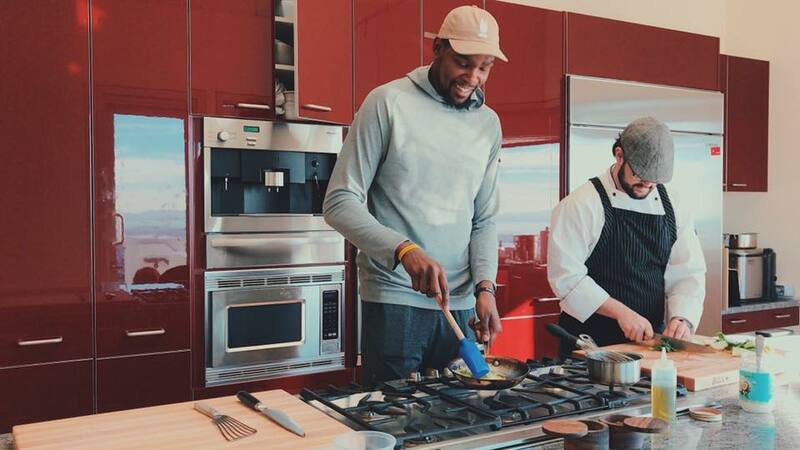 But we aren’t here to talk game stats and predictions, we are here to talk about one of the top scoring superstars you’ll see during this epic battle – Kevin Durant – and how his private chef, Ryan Lopez, is preparing him for another GSW Finals Win and chance to defend his MVP Finals title. In addition to discovering that Kevin Durant eats our sustainably raised salmon, you’ll find lots of other juicy details in this one-on-one interview with Chef Ryan Lopez. How have you been preparing kevin Nutritionally for the 2018 NBA finals? All the hard work like lowering his weight or managing his glucose levels happens throughout the season, but he is allowed cheat meals. During the playoffs, no cheat meals are allowed. At this point, it’s all about fine tuning everything, making sure to stick to a strict diet and eat all the right foods like salmon, grilled chicken and veggies. We up his intake of veggies and vitamins because the playoffs are more strenuous on his body – I mean just think about it, he’s performing at a high level and playing around 30 games within a month and a half. That’s a lot on anyone’s body, so including certain vegetables and salmon help his body recover in order to continue performing at such a high level. What meal plans do you have set up for him while competing in this final? For game one, I prepared a tarragon-lemon grilled chicken breast with chickpea pasta topped with a light tomato sauce. For the sauce, I crushed roma tomatoes and cooked them slowly with fresh basil and garlic. Once the pasta is cooked and sauce is reduced, I toss the pasta with spinach and baby kale to add a little sharpness. Fresh fruit for dessert and water with electrolytes to drink! The chickpea pasta is the star of the show. I use it for a few reasons. I use gluten free pasta because it’s easier for Kevin to digest and doesn’t weigh him down. Chickpea pasta is also very high in protein which will help him with recovery. I put the leafy green veggies in the pasta because they are abundant in a variety of nutrients. Kale is a great anti-inflammatory food and helps support a healthy, cardiovascular system. For Sunday tipoff, Kevin will be eating grilled Verlasso salmon spiced with harissa, quinoa with sautéed spinach and garlic, fresh avocado and a coconut milk tzatziki. Quinoa, it's one of the only foods to contain all nine essential amino acids that our bodies need to build lean muscle and recover from a tough game. Quinoa is also a great source of fiber and carbohydrates. Salmon is a good source of lean protein and omega-3 fatty acids. Omega-3 fatty acids help to reduce inflammation, boost reaction time and will help Kevin speed up his recovery time. How do you cook for him when he's on the road? On the road, his dietician and I work together to give him a “goal meal.” On the road, they have team dinners so giving him a meal plan that he should abide by (which also includes foods to avoid) is very important. Kevin is also a big candy guy, so we send special snack bags with him on the road to help him avoid snacking on processed foods or treats full of refined sugar. I try to make him treats flavored with agave, organic honey or coconut sugar to satisfy his sweet tooth. Something else to avoid consuming before games, or for any athlete, is gluten. Having high gluten levels are hard for most athletes to digest before a physical activity which can affect your performance. What is it about Verlasso salmon that Kevin Durant likes so much? As Kevin’s chef, I make a point to source the best ingredients for him but the ultimate decision when it comes to taste is up to him. Compared to other salmon we’ve tried, you can see a notable difference in the quality and taste of Verlasso Salmon. The flavor is a lot cleaner – it’s not as oily and fatty as others. Kevin loves the fact that it’s a meaty salmon with a very mild taste and clean mouthfeel. He really enjoys it! Check out one of his favorite Verlasso recipes here. What are the top 3 key nutrients you recommend all athletes consume when competing at a high level? B12 helps increase energy and boosts the immune system. This particular vitamin is found primarily in animal products like dairy products, eggs, meat and fish. It also helps maintain the health of the nerve cell and nervous system. Exercise has endless benefits for the body, but it can also be a major gut stressor. Research suggests that regularly consuming probiotics (the good bacteria that occur naturally in fermented foods) may strengthen the gut’s lining and lower inflammation throughout the body, resulting in less damage to your GI tract and fewer stomach problems during exercise. Always opt for getting your probiotics through foods such as: yogurt, kefir, kimchi, sauerkraut, miso, or kombucha. Always try to get this key nutrient from foods rather than supplements. Salmon is a great option and something that I include in Kevin Durant’s diet at least twice a week. Not only is it a good source of protein but the Omega 3 Fatty Acids help reduce inflammation while strengthening mental health and focus. What are your predictions for this NBA final? I think that the series will go 6 games with the Warriors winning. I think KD will defend his MVP title and score about 26 points on average per game. The Cavs always have something to prove so they are definitely going to have to work for it, but the Warriors will pull it out!